Part of making my home into a “sacred space” has been putting my personality into the walls, floors, ceilings, with my latest inspiration room being a small bathroom makeover with a touchup in the kitchen. The unusal feature I had not seen before was the use of PVC Backsplash tile bought from Home Depot. t any wall. In the makeover, I tore out the flooring and used leftover tile from the kitchen, painted the walls a cheery yellow to match the kitchen walls, and painted the aging vanity cabinet white. I replaced the slightly damaged mirror above the vanity, the light fixture, and the faucet. All this, I did over a period of time. The biggest problem area was the wall facing the door. Previously, it had been partially covered in glass tiles to make the room look larger. Those had come down and the wall had been painted in primer but that was it. Since this bathroom is the most-used in the house, I wanted something that would make it “special.” I had seen PVC backsplash tile after I’d had ceramic tile put up in my kitchen (or else I might have considered this!). 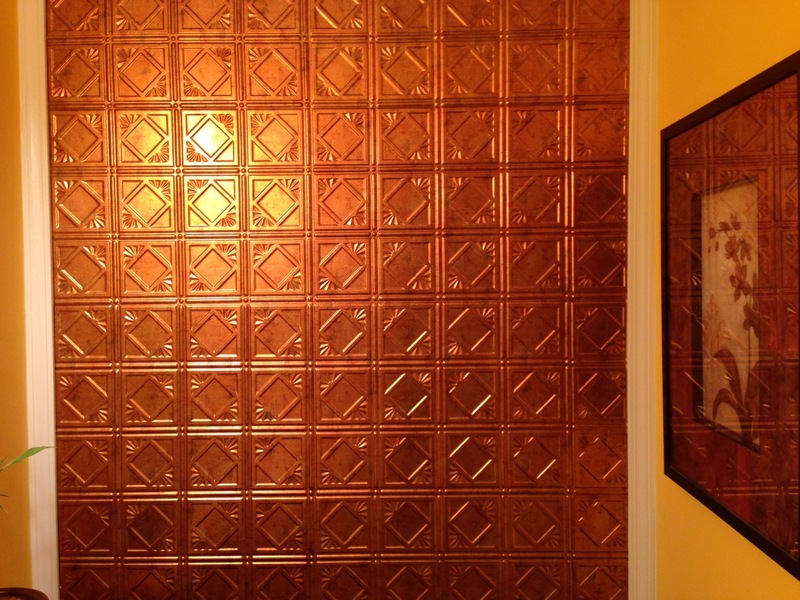 How would a wall of copper-colored tile would look, I wondered, since copper was an accent color in the kitchen. I purchased 11 PVC tiles (around $225 total), knowing I would have some leftovers and we put them up in an afternoon. The job would have been finished then had we not found that one of the walls was a little slanted so that one side of the rectangle looked off. To remedy that, we added a white wood frame, which gave the wall a more polished look. I added a decorative picture to the adjacent wall to highlight the copper colors and a bamboo plant in a copper-colored pot. The bathroom makeover consistently gets a”wow” expression from guests, mainly because of the copper wall. When I was done with the bathroom makeover, I had 2 tiles left over. No big deal. I’d find a use for them. I stored them in the garage. Shortly thereafter, my dishwasher died and had to be replaced. The new one was delivered and installed with a green protective skin on the front. The skin matched my kitchen tile so well that I wasn’t in a hurry to remove it. That was one of the months I was working 80-hour weeks and I felt pretty fortunate to have time to turn the dishwasher on, let alone remove the protective skin and fancy up the kitchen a bit. Over a month had passed when the protective skin got scuffed. Didn’t look so cute anymore! When I peeled it off, I discovered that the store had delivered the wrong color dishwasher and it clashed with everything in the kitchen. So….guess what was in the garage? I covered the dishwasher with 1 tile and a piece of another, using an adhesive rather than nails (of course). Easy, quick, looks great, and blends with the rest of the kitchen. 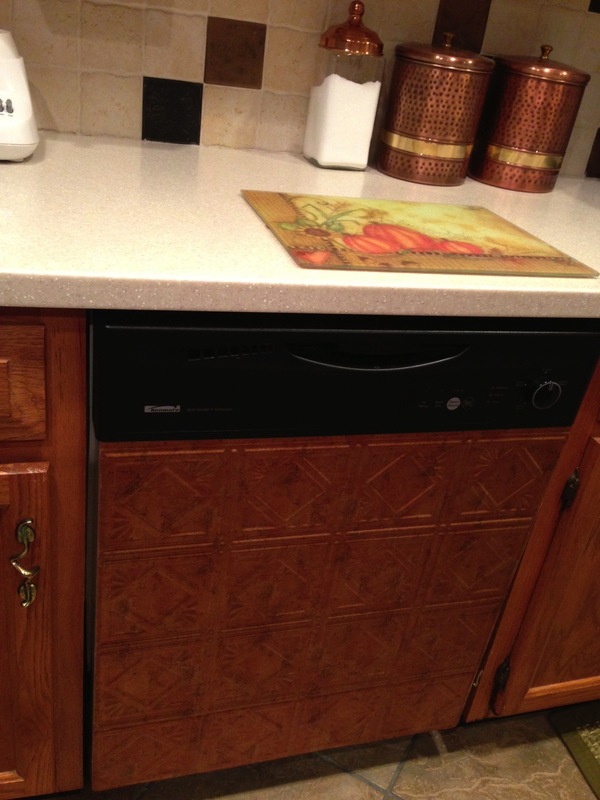 The dishwasher went from eyesore to accent piece in an hour or two.